As a person who studied hair to become a hair stylist I'm quite fussy when it comes to picking shampoos and conditioners as I know what kind of ingredients to look for. If you've been reading my blog for awhile you'd know that I love products that contain natural ingredients, I just think it's nice to be able to treat yourself using products that won't cause any harm etc. I've been using Maple Holistics for awhile now and so my opinion has definitely formed on the products. I tried Maple Holistics skincare awhile back and absolutely adored it! You can find that post here if you'd like to read more about that. So one thing I will say is I suffer from a dry scalp, especially at this time of year it starts to feel sore and tight and even though I've found products that help I try to stay away from products that may irritate it. 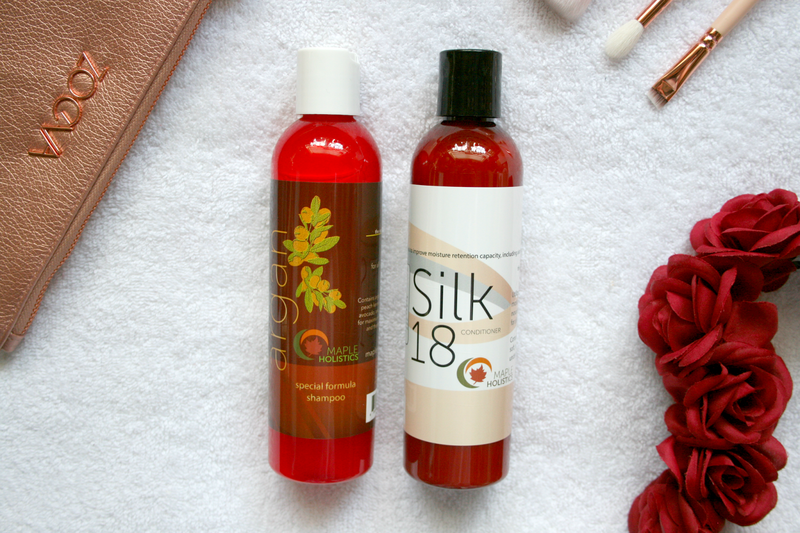 So when I received the Maple Holistics Shampoo* and Conditioner* I had to do a little research to find out some more things about them but thankfully they are both for all scalp types! Starting with the shampoo it is definitely thick and luxurious. You only need half the amount of shampoo you'd normally use when using this one and it smells like vanilla and it's just so sweet and refreshing. It feels like such an expensive shampoo which I know is a strange thing to say but do you know when you buy a luxurious product and you know it's just worth the money, that's exactly what this feels like. It also leaves an incredible shine on my hair even when I use it without conditioner which I really like. I also must add that I really like how simple the packaging is and it's something that if it was on a shelf would catch my attention. The conditioner is honestly a saviour. My hair is pretty damaged due to it being bleached so it gets really knotty really fast.This however is basically like a magic potion in a bottle. Firstly it smells absolutely divine while working the magic on my hair and keeping it from getting into a tangled mess. This makes it so much easier for me to run a brush through my hair it's insane. What I really like about this conditioner is it's nice and light so it doesn't weigh your hair down if you're looking for volume. Over all I've truly enjoyed both products from Maple Holistics and couldn't recommend them more! The shampoo will set you back $12.97/€12.07 and the conditioner will set you back $11.95/€11.12 They also last a good amount of time and I am in absolute love with both of them. You can find more of Maple Holistics products on their website here! Both of these sound lovely, I'm all about natural shampoos and conditioners so now I really want to try these!